To D3 or not to D3? The answer is simple. Yes, for leopard geckos living in captivity, you need to supplement with vitamin D3 unless you utilize UVB. UVB is a whole other discussion entirely so let’s just assume you don’t use UVB like most leopard gecko hobbyists. But to quickly go over UVB, in order to use UVB properly, you need to have a large enough terrarium (20-40 gallons minimum). The tank must have lots of shades and hides to allow your gecko to hide away from light. The UVB must be given in very limited & controlled amount each day to simulate their natural living environment. Leopard geckos are crepuscular, they get very limited exposure to sunlight in the wild. In the wild, leopard geckos burrow deep underground or hide in rock crevices to sleep during the day. They only come out to hunt during fading light early in the morning or late in the afternoon. Without limited and controlled UVB, and proper husbandry, you could harm your leopard geckos by exposing them to harsh basking lights. We’ve seen leopard geckos with severe burns as result of improper usage of UV. We’ve also seen leopard geckos with extremely dry skins because harsh basking lights are on all day long cooking their living environment. In addition, please remember not to supplement with vitamin D3 if you decide to provide UVB, or you risk Vitamin D3 overdose. UVB triggers vitamin D3 synthesis. Most hobbyists are not equipped with knowledge to provide controlled UVB in captivity. This is why we recommend against the use of basking lights for general hobbyists. This is even more important if you have albino leopard geckos, as they are extremely sensitive to light. Using UVB with albinos would likely cause burns and blindness. 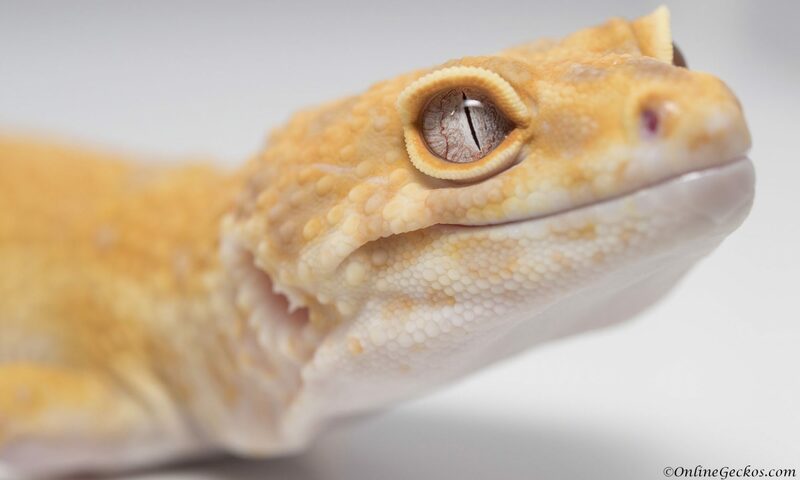 Back to D3, leopard geckos require vitamin D3 in order to absorb calcium properly. Too much D3 can be harmful to geckos, too little D3 can cause metabolic bone disease (MBD) due to calcium deficiency. So how should you supplement? Luckily there are a few good products out there that have great multivitamin with D3 balance. 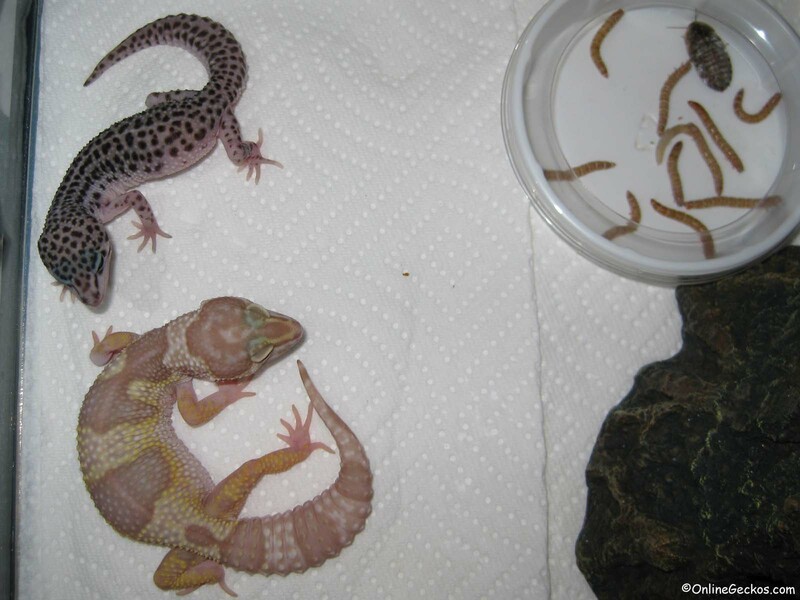 Repashy Calcium Plus and Zoo Med Reptivite with D3 are what we use here at OnlineGeckos.com. 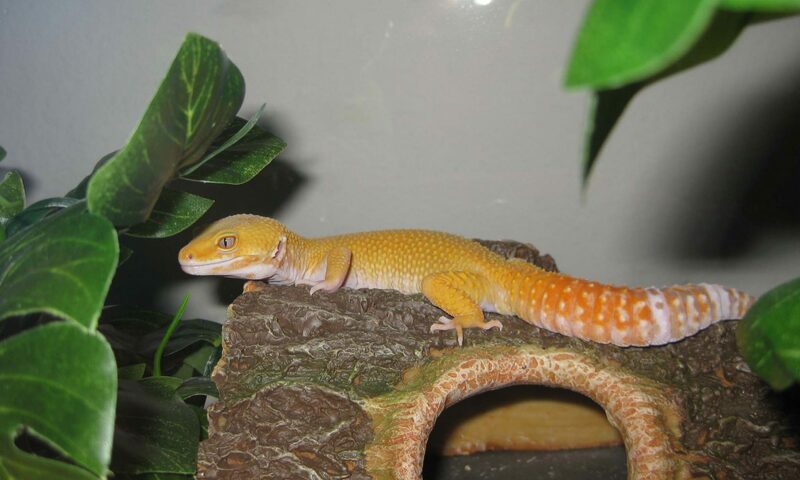 We have had great success with both of these leopard gecko vitamin supplements. They are complete all-in-one, meaning they are all you need to supplement correctly. Both of these quality products have the right balance (2:1 calcium to phosphorous ratio), and the right amount of D3 and calcium to ensure your gecko’s healthy growth. The best way to dust is what we call the “shake and bake” method. To shake & bake, you take a sandwich ziploc bag, put your feeder insects inside the bag, and lightly dust some Repashy Calcium Plus or Zoo Med Reptivite with D3 in the bag. Close it up, shake them up, and then feed immediately. Your feeder insects should be covered with multivitamin powders, and as your geckos eat them, they’ll ingest all the vitamin supplements they need. Leopard Gecko Vitamin Supplements – Do I Still Need To Gut-load? Yes! Gut-loading means you feed your feeder insects 24 hours prior to feeding them to your leopard geckos. You can gut-load with fresh veggies and fruits (carrots and leafy greens are our favorites). The idea is you stuff your feeders with nutrients and moisture, so when you feed them off to your geckos, your geckos will have a plentiful, nutritious meal. Leopard geckos get most of their moisture needs from their feeders. While they do drink water, water is very scarce in their wild natural habitat. Their bodies have evolved to adapt to the dry arid environment. They absorb moisture from their feeders, and they excrete urates as means to conserve water loss. Gut loading is an important part of your leopard gecko’s hydration and nutrition. If I Gut-load Do I Still Need To Dust? Yes! Feeder insects do not contain enough vitamin D3 for leopard geckos in captivity, even if you gut-load. Diurnal species such as iguanas and bearded dragons can synthesize vitamin D3 from basking under UVB all day long. Since leopard geckos are crepuscular, they get very limited amount of UV exposure even in the wild. Crepuscular means they are the most active during twilight around dusk and dawn. Dusting with an all-in-one multivitamin is necessary even if you gut-load. Also most feeder insects have inadequate calcium to phosphorous ratio as we covered in our feeder insects nutritional value guide. You can see why dusting with a good leopard gecko vitamin supplement is absolutely necessary. The next question you have is likely what the supplement schedule should be, and how often you should dust. This will depend on your gecko’s age and health. For hatchlings and juveniles under 8 months old, dust at every feeding. Leopard geckos do most of their growing within the first year. You want to make sure they get all the vitamins they need, and proper calcium for bone growth. For ill and recovering geckos, as well as gravid females, you want to also dust at every feeding. Gravid females require all the vitamins, protein, and calcium they can get to produce eggs. Egg production is very hard on their bodies, so they need the extra supplements. Not to mention gravid females tend to fast and not eat for long periods of time, sometimes months at a time. So when they do eat, you want to make sure their feeders are well dusted. As for geckos with health issues, supplement until they have fully recovered. For sub-adults between 8-12 months old, dust at every feeding if you feed every 2-3 days. As they mature they will start to eat less, and will likely move from feeding every day to feeding every 2-3 days. You will end up with a dust schedule of 2-3x a week, which is more than enough. For adults over 1 year old, dust at every feeding if you feed them once or twice a week. Adults usually feed only once or twice a week, so you will end up with a supplement schedule of 1-2x a week. This is more than enough for adult leopard geckos, unless you have female breeders, in which case as stated above, dust at every feeding and feed often. Some hobbyists wonder if they should also put a bottle cap full of calcium in the tank. This is optional, and it won’t hurt. If you choose to do this, make sure you get pure calcium without D3, and phosphorous free. A good example is Zoo Med Calcium without D3, or Rep-Cal Calcium without D3. I would recommend offering calcium without D3 in the tank if you have a female breeder, or if you have geckos recovering from health issues like MBD. Do not use calcium with D3 in the tank as the gecko may ingest too much D3. You are already offering D3 via multivitamin dusting. Following these simple instructions, you will have healthy geckos that are well supplemented, with no vitamin or calcium deficiency issues. Be sure to get yourself escape-proof feeding dishes such as OMEM Ceramics Made Worm Dish. Smooth surface and inwardly curved walls make them perfect dubia roaches & mealworms escape-proof feeding dishes. Also Zoo Med Stainless Steel Feeding Tongs will make feeding easier and more hygienic. With them you won’t have to touch feeder insects, plus they are durable and easy to clean. Lastly don’t forget a water dish. We like the Exo Terra Water Dish because its nonporous surface prevents bacteria buildup. We’ve made a guide to assist you with choosing the right feeder insects for your geckos. Even with vitamin supplements, picking the right feeder insects play a big role in the health and well-being of your leopard geckos. Read our Leopard Gecko Feeding Feeder Insects guide here for a list of popular feeder insects along with their nutritional values. Remember to not over-feed your geckos. Obesity is a serious health issue even for leopard geckos.